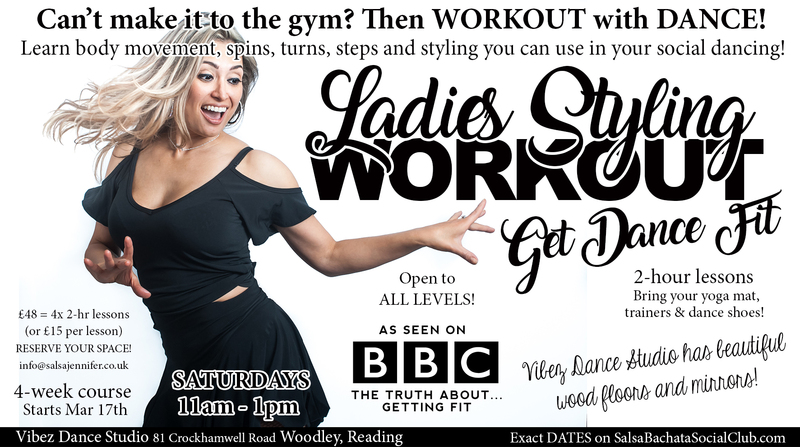 Are you unsure of your Ladies Styling Technique & want to get DANCE FIT? Do you wonder how all those BEAUTIFUL DANCERS move with such grace, confidence and flow? Do you struggle with your TURNS and SPINS, but want to add MORE FLAVOUR to your DANCE? In these structured 2-hour sessions you will be able to address different elements in your dancing: body movement, foot placement, balance, turn techniques, hand styling, following technique, shine patterns… even dance floor etiquette! The classes are about growing and finding YOUR OWN STYLE. You will join a supportive enviroment with other ladies wanting to improve their dance skills. BRING: Matt, sport shoes, & dance shoes (no dance shoes no problem!)! Be ready to have a fun workout! You learn steps and body movement you can use in your social dancing! We do ‘the work’ in class to that we can feel confident and strong on the dance floor. SALSA SOCA BACHATA CHA CHA and KIZOMBA! New course starting SOON! Send and email to info@salsajennifer.co.uk to join the email list. The dance studio has beautiful wood floors and mirrors! AS SEEN ON BBC 1’s ‘The Truth About Getting Fit’: Jennifer Benavidez has 19+ years of dance experience! She regularly teaches at different dance festivals,congresses, holidays, resorts, corporate events and for TV. She is a guest presenter for the award winning 5 Star Luxury resort The Body Holiday in St. Lucia, the West Indies. In the UK, she is one of the salsa coaches for Reading University, organises Salsa Bachata Social Club, and teaches for Red Hat Salsa.